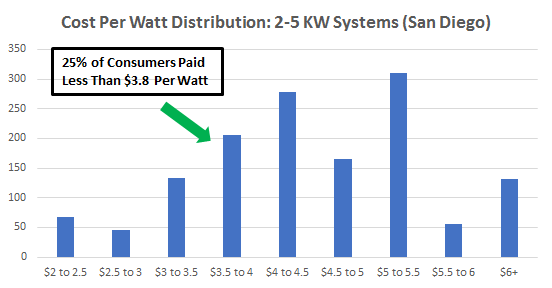 For a large system, the average cost of solar panels in San Diego is $4.09 per watt (before incentives) and 25% of consumers paid less than $3.44 per watt. For a medium system, the average cost of solar panels in San Diego is $4.60 (before incentives) and 25% of consumers paid less than $3.80 per watt. 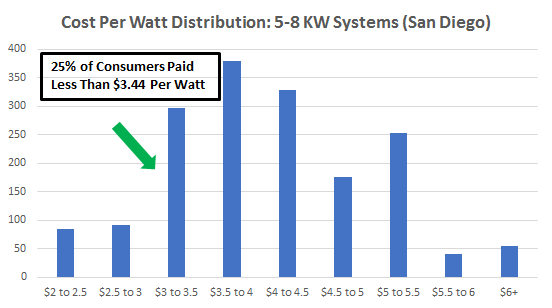 So if you are looking to get the best price for a solar system in California and have an average sized system, you should find an installer below $3.50 per watt. Residential solar installations have increased significantly in California, although growth slowed in 2016. From 2010 to 2016, installations have increased from 18,000 to 150,000, making California the largest residential solar market in the U.S. by a wide margin. The slowdown in installation activity and installer turmoil, has created a buying opportunity for consumers. 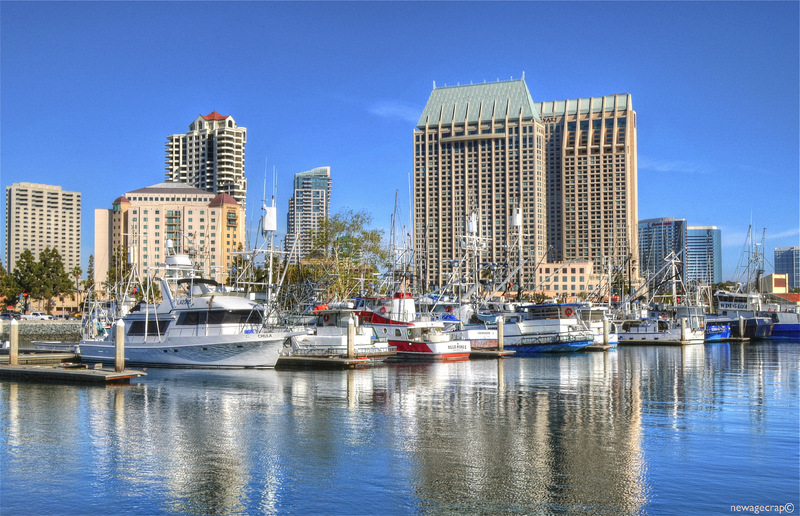 In San Diego, installations have increased from 2,700 in 2010 to 26,800 in 2016. San Diego solar permits decreased 35% to 497 in June from 762 in June 2016 and decreased 4% from May 2017 (YTD decrease of 39%). 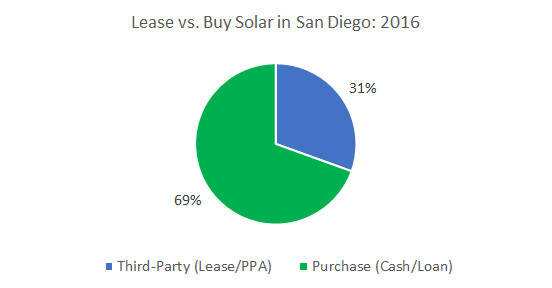 In 2016, 69% of consumers purchased their solar system either with cash or a loan vs. and 31% used a lease or power purchase agreement (PPA) structure. Refer to our lease vs. buy guide to understand the implications of solar financing options. 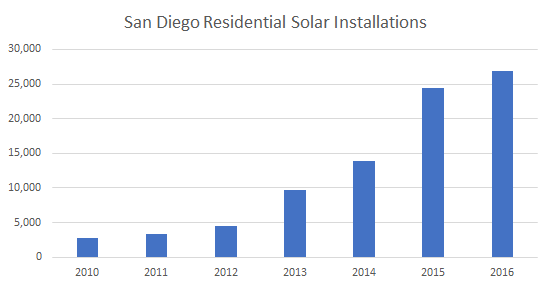 The percentage of consumers that purchased their solar system in San Diego has increased in 2016 due to an increasing number of low-cost solar loans. Choosing a solar installer is arguably the most important step of going solar and we recommend reading our guide on how to choose a solar company. 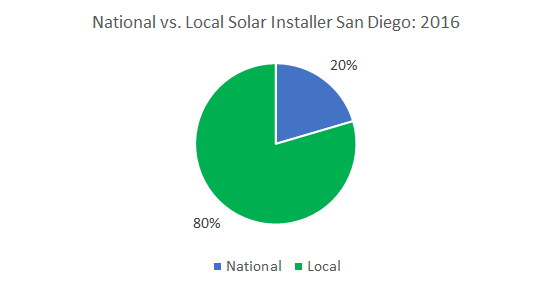 In San Diego in 2016, approximately 80% of consumers chose a local installer vs. 20% that chose a national installer (SolarCity, Vivint or Sunrun).